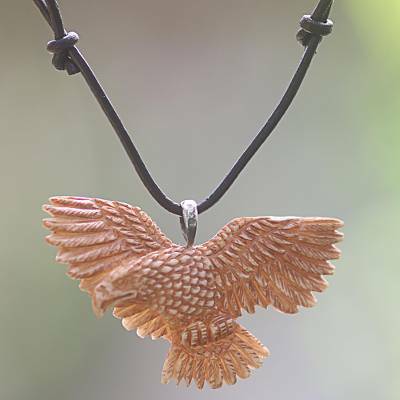 Hand Made Bone Pendant Necklace Eagle from Indonesia, "Stoic Eagle"
The proud shape of a stoic eagle is hand-carved from bone in this unisex pendant necklace. Made Wardika designs this Indonesian work, hanging it from a leather cord. You can find bone pendant necklace 'Stoic Eagle' by Made Wardika in jewelry categories such as Animal Themed Necklaces, No Stone Necklaces, Bone Necklaces, Silver Necklaces, Sterling Silver Necklaces, Leather Necklaces and Pendant Necklaces. Enjoy exploring these sections for other Novica treasures. Wardika comes from a village that specializes in bone carving, a traditional Balinese art that has been passed from generation to generation. When he was eighteen, he began to work as a bone carver and determined that he would become a master carver. Every day, he carefully studied and copied the techniques of the best carvers until he became their equal. Today, he earns a living and proudly supports his family with the sales of his unique carvings. He is able to give work to others in his community and hopes to teach this art to the next generation. Wardika began working at the age of eight, first painting and then carving exquisite images in bone. He sat for days on end to do his work and, as a result, has developed health problems. About two years, ago he began to have trouble with his spinal nerve. He was only able to stand or walk for minutes at a time and this left him unable to work. Therapy and natural healing have eased the condition but he has developed a phobia about soft mattresses. He will only sleep on very hard mattresses as he is afraid of becoming paralyzed and permanently disabled. He draws strength from his family, works at therapy and struggles to return to normal while fighting an ongoing battle with his phobia. Wardika was a street vendor with an unpredictable income until he joined Novica and shoppers discovered his unique work. Now his Novica sales provide a stable income and he is able to employ artisan assistants to help produce his jewelry. Made Wardika has received 4 microcredit loans with 0% interest from Kiva and Novica, the first for $600 and the most recent for $4000. Wardika and his family and his four assistants and their families are dependent upon the steady income that Novica provides. Made provides for his three children and is deeply attentive to teaching them respect for the elders and the natural world. Made Wardika provides for the education of his children. Executed in bone this pendent is one of the nicest I have seen. Not just on NOVICA but in my travels around Asia. Love his work and fine details!